It was the best of times.. ..It was the worst of times! At Jos’burg Airport things began to get better because a representative of Air 2000 met us and ushered us thru Customs..... and that is a whole story in itself... I’ll save it for a future woe-is-me article and the last part of the worst of times. Chris Troski the owner of Troski Safaris met us also at the airport and then drove us to Transavaal District and where we would be staying for the next 8 days. The facilities at the game ranch were absolutely lovely. As you have seen in some of the photos it was a luxury none of us expected. The compound had a swimming pool, individual housing (we each stayed in one) a large building with a dinning room and open bar and open fire pit area, excellent staff... and our host Chris, the chief Chef Charmain Changuion. She also managed the compound staff. And another professional hunter Tony . I must say they did everything they could to make us comfortable, and give us an experience few have when they hunt Africa today. We would head out after breakfast (four different choices of food)... driving towards sunrise... and be in the game fields until around 11 to 11:30 a.m. The game begins to lay up around then, so we would go back and have lunch, (usually three or four different foods) rest, swim, have a beer or two and around 2:30 or 3 p.m. head back into the game fields. 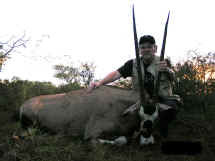 We then would hunt till dark... around 7 p.m.
My best example is the gemsbok that I took. We saw them everyday, but seeing a 40+ incher was a now and then thing. And they were always on the move. The trophy I got, I would like to say I hunted him hard for days... but the truth is, we came around a curve in the hunting truck, and he was standing in the road about 160 to 170 yards in front of us. I shot him with a Browning levergun in .358 Winchester. It was loaded with a 250 grain Swift bullet. And that was the first problem... we found later the bullet didn’t open but penciled thru from the ribs back and stopped in the muscles of the rear leg. I borrowed J.J.’s custom Ruger 480 S/A, and gave J.J. the levergun. And then J.J., Myself, Chris, a friend of Chris, and our tracker Abraham started on foot for a 2 1/2 hour tracking job over four or five miles of heavy brush, wait-a-bit thorn, thick stands of short trees and very high grass. Mostly of course finally finding him was because of the skill of Abraham and Chris... we jumped him three times. I hit him with one shot from the Ruger on the second jump, at around 150+ yards. 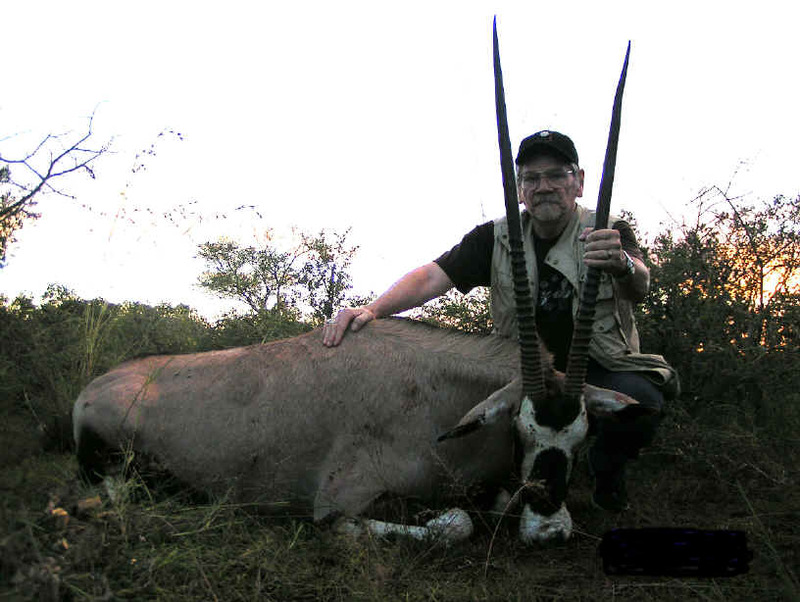 Finally with the sun low in the western sky and night coming rapidly, Chris and his friend went around a stand of heavy brush and trees... J.J., myself and Abraham went the other way around them, and I saw the just gemsbok’s rear sticking out of the brush. He was watching Chris and unaware of us. I shot him in the root of the tail at about 80 yards, he leaped forward thru the brush and went down in front of Chris Troski. When we got to him, he was still alive... his back was broken but he could still reach up with those long and dangerous horns. So I broke his neck with a final shot from the Ruger 480. To the right of the dinning room building was a open area with a fire pit and a large semicircle stone wall and seating area around the fire.... every night a fire of hard wood would be started and allowed to burn to coals, then the coals shoveled into the cooking pit and the meat of the evening would be roasted, usually several different kinds. While we had a sundowner or two, fine conversation and fellowship. Chris, Tony, and Charmain were the perfect hosts... it was like all of us had known each other for years.... the end of each day at the fire was one of the high points of the trip. This trip to South Africa for me ended a forty plus year stretch of time since I lived in Africa. I spent a few years there in the late 1950s and early 1960s. I can safely say that though the whole continent of Africa has now changed.. Terrorism, starvation, genocide, and so much more that is sweeping away a great land... South Africa has for the most part solved her problems. The country is secure, politically stable, and relatively safe. I’m sure like any country there is crime in the big cities... but in the hunting areas, except for motor vehicles and clothes... it’s much like it was 46 years ago. Quiet, lovely, hospitable and friendly.... you just have to join us next year..... PACO.